This dashboard view shows recent captures from my Twitter feed. The popular notion of the Web and social media is that, once something’s out there, it will never disappear. The truth, however, is that much of what exists on the Web and social media is fleeting and constantly changing. The website or Twitter feed you view today may well be different from what it was just yesterday. From a legal standpoint, this can be a problem. Often, there is a need to preserve something on the web as it is at a particular moment. You may want to capture a web page as evidence of a possible trademark violation. You may practice in a state where professional responsibility rules require you to maintain periodic snapshots of your firm’s website. You may work for a corporation that has a legal responsibility to preserve certain forms of web content. You may want to keep a record of an opponent’s site during litigation. I have been testing a platform, Reed Archives, that makes it easy to archive websites and social media. More importantly, it does it in a manner that is forensically sound so that the archived information can later be authenticated and used as evidence or as proof of compliance. The platform is a product of Reed Technology, Horsham, Penn., which is a company owned by LexisNexis. As web pages are archived, they are digitally signed with unique hash values and date-stamped to verify that they are digital carbon copies of the original as of that point in time. Websites can be archived in either of two ways, either as scheduled captures that you configure in advance or as on-the-fly captures using a browser plug-in. To schedule a page, you simply enter its URL and indicate how often you want it captured. Scheduled captures can range from hourly to monthly. Options allow you to designate a folder to store the captures or specify tags to assign to them. Alternatively, you can archive any web page as you browse using a browser plug-in called the Reed Tech Web Preserver. The plug-in adds two buttons to your browser toolbar. Click one to capture a single web page. Click the other to turn on recording and capture an entire browsing session. Unfortunately, the plug-in works only with Internet Explorer. For users of the Firefox or Chrome browsers, a bookmarklet takes the place of the plug-in. The bookmarklet lets you capture a web page, but it does not allow you to record a browsing session. 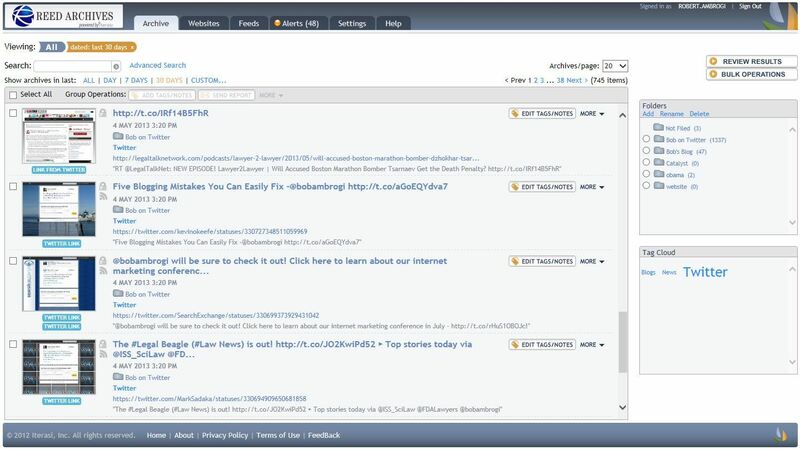 In addition to capturing web pages, Reed Archive can also be configured to archive social media and RSS feeds. For example, you can set up a feed to capture all Twitter posts by a designated person or regarding a designated topic. When you capture from Twitter, the capture includes any items linked in the tweet, such as a linked article or photo. Likewise, you can add an RSS feed to capture every update on the feed. In this way, you could capture every new post on a blog, for example. Beyond capturing specific pages or feeds, Reed Archives can be configured to monitor social media for specific search terms and keywords. This could be used to watch for appearances of a client’s name, for example. When new matches are found, Reed Archives notifies you by email. Once in the archive, everything is available to you by way of a central console. In addition, it is all fully searchable using either simple or advanced search. Items can be assigned to folders or given tags. Items can be exported, either individually or in bulk, to PDF or EDRM XML format, with the digital signature included. The XML format includes an HTML index file that will replay the archived pages in their original format. The cost of a subscription to Reed Archives is $35 a month for a single user. As you add more users, the price per-user drops, down to a minimum of $12 per user for larger firms and companies. The subscription includes 10 GB of storage for your archived data, with additional space available as needed. Reed Archives is easy to use to capture web pages, social media and RSS feeds. It preserves digital duplicates of web pages and assigns them forensically defensible encrypted hash values. It has a broad range of applications for legal professionals, from securities compliance to records retention and management to evidence preservation and litigation holds. At a cost of roughly $1 a day for a single user, it is a reasonable value for any legal professional with a need for a website archive.